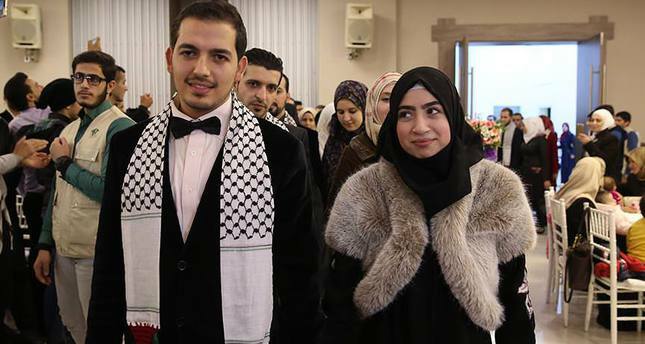 Fifty Palestinian couples tied the knot at a mass wedding ceremony in Istanbul on Friday night, with some young grooms catching only a brief glimpse of their far away wives on the internet. Mohammed Abu Taqiya, 26, was one such young Palestinian groom who saw his wife just for a few moments over Skype on his wedding night. "My wife could not come to her own wedding because she is in Gaza behind the closed border gates," Taqiya said. The young groom, who is a graduate student at the Ege University in southern Izmir province, said that he had never met his wife. His mother had arranged the match when some months back he expressed a wish to get married. With the consent of their families, the young couple then began to interact with each other and eventually decided to get married, even if it meant that the ceremony would take place thousands of miles apart. The young husband and wife now pray every moment that Gaza's Rafah border crossing gate reopens soon. According to the UN Office for Coordination of Humanitarian Affairs, Israeli restrictions on the movement of people and goods to and from Gaza have undermined the living conditions of 1.8 million Palestinians in Gaza. While many restrictions were imposed in early 1990s, they had been intensified following the takeover of Gaza by Hamas in June 2007, which resulted in an Israeli blockade. "[Moreover], the situation has been compounded by the restrictions imposed since June 2013 by the Egyptian authorities at Rafah Crossing, which had become the main crossing point used by Palestinian passengers in the Gaza Strip," the office added. While some couples like Taqiya didn't even get a chance to be with their wives on the wedding night, others like 24-year-old Celil Selmi and his wife, who was present with him in Istanbul for the ceremony had a different, yet still heart-wrenching lament. Although this young couple had each other on their big day, none of their families could make it on their big day. Selmi said that he wished his family could have passed the border and participated in his wedding in Istanbul. "Maybe 50 years from now, I will be able to hold a ceremony with my family in Palestine," he sighed. There were several other young men like Taqiya and Selmi who shared similar woeful tales on a night which was supposed to be their happiest moments of their lives. While technology came to the rescue in such bleak moments as bride and groom's families participated in the ceremonies through internet video call conference apps such as Skype, many still missed the physical presence of their loved ones. Because of the impossible border situation, especially for Palestinians living in Gaza, it was not uncommon to hear at the event about a groom meeting his bride's father for the first time at the wedding ceremony itself. The mass wedding event was organized by Turkey's Mehir Foundation and the Association of Palestinian Scholars. Each couple was also given a present of 15,000 Turkish liras to start their new lives. The couples were thankful for the mass wedding event, emphasizing that without the help of such organizations, their dreams of marital bliss would have remained unfulfilled. The mass wedding ceremony event included dancing and some good food. Two little Palestinian girls also read out their poems in Turkish to soothe the aching hearts and make them forget about their pain in their moments of joy.